This was a wonderful trip out to angel island. The tram ride was nice but then we were trapped another 3 hours on the island they need to add ferries we caught the 3,15p one on li y because I was smart enough to get in line 30 mins in advance which was hard with osteoarthritis in both my knees. They had limited space. So most people would have to wait for the next ferry. The island is a very historic place and it offers a beautiful nature. You can spend a few a hours on the island or as much as the whole day. Angel Island is the equivalent of Ellis Island out West where the vast majority of Asians entered the U.S..There is also a small museum that is very informative explaining the different historic stages this island went through from a Military Post to an Immigration Station. I suggest to get the tickets in advance and go as early as possible in the morning. Angel Island is marvellous. So much history! The shuttle tour is absolutely worth it! Make sure to have cash before you reach the island as the immigration station requires it. There is an ATM available, but unfortunately it was out of service on our trip. Ferry ride over to Angel Island was beautiful. Just make sure when you turn in your voucher for your round trip fare, you receive two tickets per passenger. See more on the top deck! The crew is always professional. We had a sailboat steer too close that forced the captain to slow, but we never had any abrupt coarse change. Warning horn blasts were sounded, and finally the sailboat cleared. Very enjoyable and relaxing trip. Love to learn the history about the island. The little café food was great. Love it! 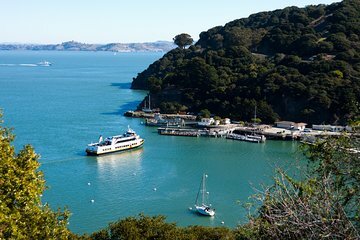 The ferry trip to the Island was a busy one, as the same ferry also went to other further destinations - Tiburon, Sausalito etc. The island was much larger than I anticipated. I almost thought I was going to get lost. Good thing GPS with Google Maps works on the island. Trekking to the top of Mount Livermore is a light workout, and the sights from the top are breathtaking, especially on a clear day. It will take quire a few hours to get around the entire island, but I was satisfied with where I went. We missed the ferry as Viator printed the wrong ferry departure time on the voucher and the only other ferry to Angel Island was too late. Thankfully, we were permitted to re-book the following day.